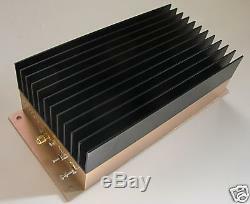 This LOT is one RF Bay, Inc. New 902-928MHz 10W RF High Power Amplifier, Model Number: HPA-915 with SMA Female Connector. This unit provides 40dB gain, Pout greater than +40dBm with 12V DC power operation. This amplifier designed for 915MHz ISM Band wireless video transmitter amplification. Detail Spec on Web as follows. The item "902-928MHz 10W RF Power Amplifier, HPA-915, New, SMA" is in sale since Saturday, April 26, 2008. This item is in the category "Consumer Electronics\Radio Communication\Ham, Amateur Radio\Ham Radio Amplifiers". The seller is "rfextra" and is located in Gaithersburg, Maryland. This item can be shipped worldwide.